Some time ago CMIRC was given a hundred or so “indestructible footballs” from One World Play to distribute to children who might otherwise not have access to such wonderful equipment. The balls were part of a large donation from Chevrolet and we thought our official involvement in the project ended last year when we discovered we could no longer obtain balls and thought we'd given away the last of our allotment. However, in cleaning out our "Rotary room", storage area in preparation for our move this month we discovered some additional balls! Six balls went to the Thai/Burma border with the Mae Tao Clinic tour in early February. 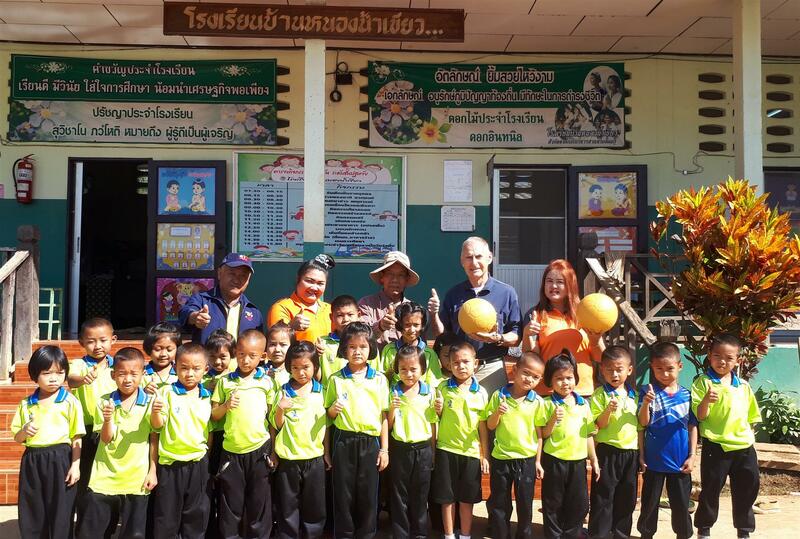 Two of the balls were distributed to the Nong Naam Kiew Migrant Learning Center supported by the Rotary Club of Bangkok South (pictured above with RCBS Rtn. John Quambry). The last four balls were given to the Burma Children Medical Fund for distribution to children they serve.